Edward Hugh Dennison was born in Oct 1925, probably in Caythorpe. In 1939 he was living with James W Dennison at the Old Rectory in Normanton. James was probably his grandfather and the family moved from Caythorpe around 1929. The next we know of him was March 1945 when he was a junior seaman on the M.V. San Cipriano, an 8000 tanker which had sailed from Antwerp to New York. Her sister ship, the San Demetrio featured in the 1943 film San Demetrio London. Edward would have been too young to join up at the outbreak of WW2 but just about old enough to join the Merchant Navy as a boy rating. He may have been inspired by his neighbours John Chambers and David Brister, who were in the Royal Navy. He received a merchant navy medal. 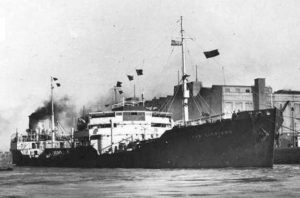 The San Cipriano survived the war and there’s no evidence that Edward died in the merchant navy. The only recorded WW2 death is that of L/Cpl E H Dennison of 247 Provost Company, Royal Military Police, who died in Belgium on 15 Aug 1947. He is buried at Heverlee War Cemetery, to the east of Brussels.